As part of the Design Mart exhibition at the Design Museum I was commissioned to produce a series of lights to be displayed down the central stairwell. I had recently started working with found spectacles and I became interested in how retailers display and present new ranges of spectacles and sunglasses to show them at their best. In many cases these products are illuminated from behind in order to focus on the colour and shade of the specific lenses and also to highlight the quality of the material being used in production. I wanted to utilise a similar way of display but with a collection of carefully chosen vintage frames of prescriptive spectacles and sunglasses. In order to emphasize the various strengths and colours of lenses I created two layers of spectacles. The finished light is similar to a Victorian collection of exotic butterflies in a glass museum vitrine. 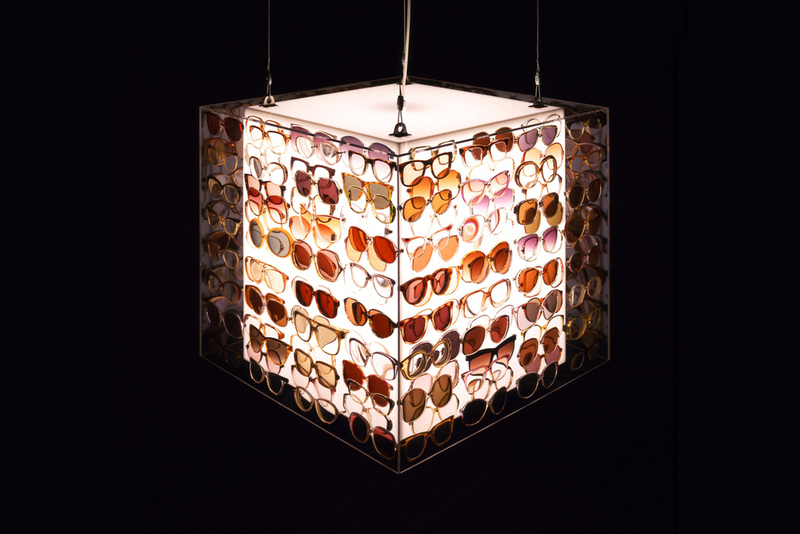 Material – Found vintage prescriptive spectacles and sunglasses, acrylic cubes and incandescent light bulb.